Time to upgrade M2's room to a little boy room instead of a nursery. Winnie the Pooh and Piglet are now gone in favor of fire engines and dalmatians. 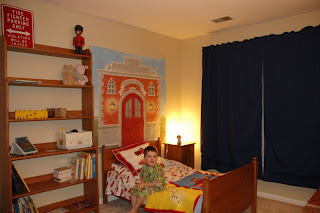 M2 seemed to be pleased with everything in the new room from the paint and curtains (compliments of grandma) to the firehouse mural on the wall and fire truck sheets. However, when we placed the nightlight in its new location - he had a fit. Go figure! Can't win them all I suppose.